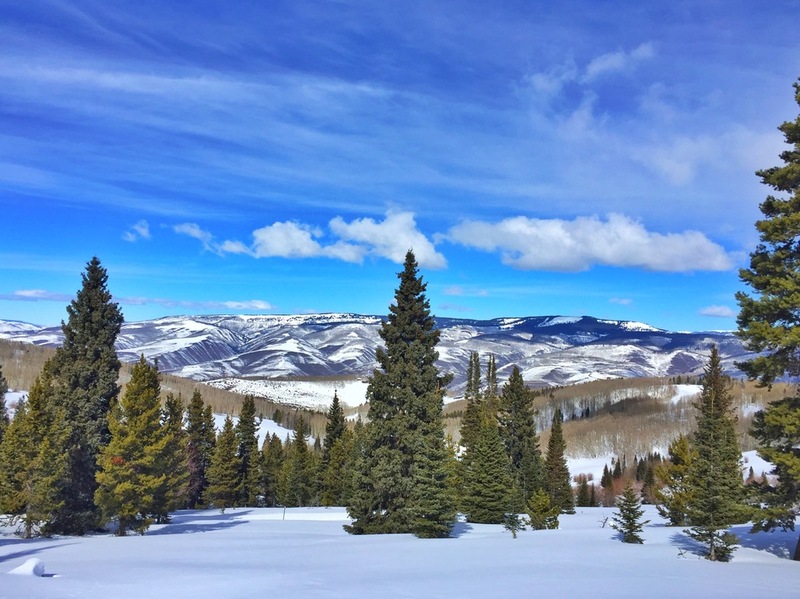 Whether or not you like to ski, a weekend in Beaver Creek can be the perfect way to enjoy winter with family or friends. "Apres" Skiing is more my Cup of tea, but there are still plenty of ways to enjoy stunning views and partake in other great winter activities in the area. There is plenty to do to keep yourself occupied for a week, but you can pack in a lot into a visit to this quaint town even if you're just coming for a long weekend. 1. 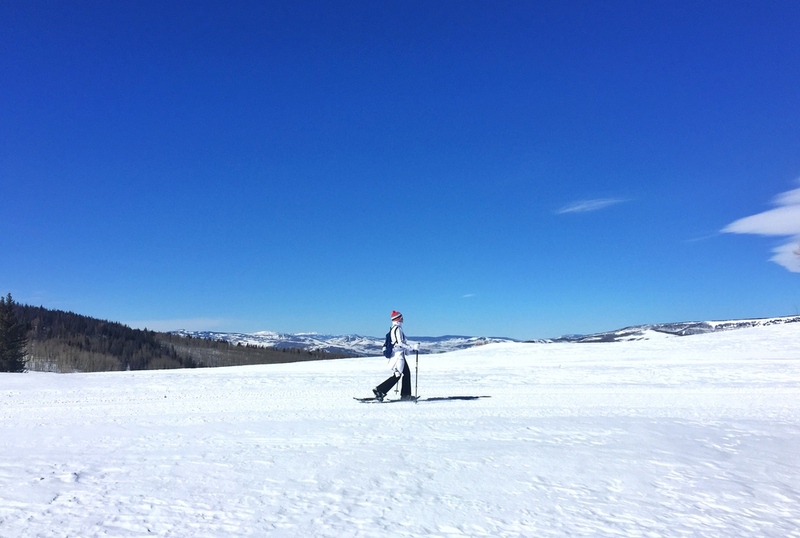 Day Trip to Vail- If you're faced with less than ideal conditions for the slopes one day, take the short trip into Vail. We started the day enjoying Aria spa in Vail Cascades, which is just outside of the main hub. Spas often offer specials via Groupon or Living Social, so it's great to search whatever zip code you're traveling to. It also doesn't hurt to just ask the spa directly. We were able to finagle a massage, mimosa, and yoga class for less than the price of a massage alone. We then took the free shuttle into Vail to avoid parking, and ate a wonderful lunch at Sweet Basil. The pork schnitzel was excellent, and so was the view of the Gore Creek from our window-side table. You're likely to spot a moose as you walk across the covered bridge as you leave town! 2. Snowshoe to Discovery Overlook- Snowshoeing is probably the easiest winter activity to master. The main requirement is that you or your buddy are good with a map. Otherwise, you just need to be physically able to hike for a good couple of hours. This is also a less expensive sport than skiing; $75 covered the lift ticket & boots, poles, and snowshoe rentals at the Nordic Center. We experienced some awesome scenery along the way to Discovery Overlook, including tons of birch trees, an igloo, and even a yurt! You'll want to bring along a bottle of water and a meal replacement bar, due to lack of food options other than the "Candy Cabin". I had a blast with my snowshoe buddy, Aunt Kathy! She was a trooper as I led her through some questionable paths. I think she would agree the views were worth it in the end! 3. Spruce Saddle Lodge- Since we had a shorter second day of snowshoeing, I decided to take full advantage of my lift ticket and ride to the top of Chair 6. You are permitted to go up without equipment, and all you really need are good snow boots. It was a long way up, and watching the Beaver Creek's village get farther and farther away was amazing from the gondola I was in. Watch out for skiers coming from every direction, but there are plenty of spots off to the side to get some amazing views and photos. My husband was finishing up his skiing for the day as I arrived at the top, so we met up to enjoy an apres ski refreshment and some fabulous views from the outdoor adirondacks. 4. Apres Ski at Park Hyatt- as opposed to a more serene break at Spruce Saddle, Park Hyatt is the happening place to enjoy a lively evening of apres skiing. You can check out the champagne tent from 12-4, and enjoy s'mores happy hour from 4-5 by the fire pit. If you're over the outdoors after a blustery day, head into Antler Hall for libations and live music instead. You don't have to be a hotel guest to take advantage of the people watching and entertainment. 5. Coyote Cafe- A short walk away from the Park Hyatt is this cozy dinner spot. They easily accommodated a large group and had an extensive list of interesting margaritas. It's also right across from the ice skating rink, which often has special music and great people watching. For someone who loathes the cold weather and expected to hibernate in our condo the whole time, I was surprisingly blown away by the scenery and other activities offered in this lovely town. Beaver Creek actually made a snow lover out of this beach bum! A weekend companion: the Turkish towel. It's a scarf, it's a plane blanket, it's a TURKISH TOWEL! Woven in Turkey using 100% cotton, Turkish towels are more than just a towel, although they are that too. Even though they are very lightweight and thin, the 100% Turkish cotton is very absorbent and quick-drying. These towels are the perfect weekend accessory because of their multi-purpose use as a throw, wrap, towel, and even as a stylish scarf. I just spotted Britt wearing hers as a scarf over the weekend after she checked out SEWE. I met Britt at a market in December, where she was excited to be able to get a replacement for her long lost Turkish towel she got while traveling there. Britt is an amazing hand letterer and artist (check out her beautiful work at www.brittbates.com and on instagram at @Britt.Bates)! You can shop similar styles to the one Britt is wearing HERE. Here to help me share one of MY favorite ways to eat in Charleston is one of my Charleston-loving friends, Annie Harris. She's a wonderful lady I met in college, and also a fabulous mom, librarian, baker & foodie! Check out her tips on how to execute the perfect progressive dinner, with some specific spots to try if you want to maximize your Charleston dining experience. One of the featured spots I'm most excited about is the newly renovated Restoration Hotel (pictured above). They are celebrating their grand opening tonight, and will surely be your new favorite rooftop spot in town. So, you are planning a weekend away… If you are anything like me, the first thing to plan is the food: Friday night dinner; Saturday breakfast, lunch and dinner; Sunday brunch… but that’s only five meals! How do you fit in all the dining recommendations you’ve been given by friends, the restaurants you saw on your favorite foodie show (Top Chef fans, I’m looking at you), and all the spots that you spent hours ogling on Eater before your trip? Never fear foodies, I have a solution for you: it’s the progressive dinner (and it is my jam)! In a traditional progressive dinner, a group of people go from one person’s house to the next eating a different course at each home. I have modified the basic concept, and instead of visiting the homes of friends, I move from restaurant to restaurant eating a different course at each establishment. This method is great for maximizing a weekend (or, in my case, a rare night with a babysitter) because you don’t have to pick just one place, one type of food, or even one menu item. You really CAN have it all my friends! 1. When I plan a progressive dinner for myself, I usually plan on about four different restaurants. I try to go to one place for an appetizer, one for soup or salad, one for an entrée, and one for dessert. You can also do an appetizer crawl getting small plates at each place. Then, throw in a bar at the end for a nice after dinner cocktail. 2. Plan a route as well as the meal. Think strategically about where you are starting and ending. If you’re going to be drinking, think about driving to the first couple of places, leaving your car in a safe place, and being able to walk to the final few destinations. 3. If you’re going out with a group, you probably want to cap the amount of people to four or five. It gets hard to coordinate too many people when going to multiple destinations, so being able to fit all in one vehicle (and at one table) is ideal. 4. At nicer restaurants, think about sitting at the bar or in the bar area. Since you aren’t ordering a whole meal, it’s friendlier to the wait staff not to take up a whole table. You’ll get in and out more quickly if you don’t have to wait on a table, and there is no need to worry about reservations (or the lack thereof). 5. Share food at each stop and order small portions when the option is available. You’re going to potentially eat four courses, so come hungry friends. Start out with some raw oysters or peel and eat shrimp at Leon’s on Upper King. It’s really casual and fun with indoor and outdoor spaces. Plus, they have a great drink menu including my favorite thing, champagne! It’s a fun way to get the evening started. They have parking, so it is easy to drive there. After Leon’s, I would drive to a parking deck on Hassell St. and park your car while you walk between the next few places. Once you park your car, here is a walking map for the last four destinations. Cru Cafe is a bit off of the beaten path in an adorable historic Charleston row house. The food is really fresh, local, and inventive. It is great for a starter course because they have quite a few salads that they will serve in appetizer or entree sized portions. Their small plates are also tasty. I’ve had their Mesclun Fried Goat Cheese salad and highly recommend it. This is my all-time favorite restaurant in Charleston. It has been around for ages and does everything right. There is a great family style table here that is perfect for your quick stop during a progressive dinner. I say go ahead and get one of the southern fried seafood platters or the classic shrimp and grits. You will not be disappointed. Share it though! One is definitely enough. Peninsula Grill is famous for their coconut cake, so this is where you need to go for dessert. If (like my poor misinformed husband) you don’t like coconut, don’t worry because everything here is divine. They also have a champagne bar (be still my heart), so you can get some bubbly to celebrate a wonderful evening! There are lots of great places to go for cocktails in Charleston. I chose the Watch, which is on the roof of the Restoration Hotel, because from Peninsula Grill, it’s a nice walk through the Belmond Charleston Place Hotel and then just two blocks up King Street. You can window shop and walk off some of the food you just ate! Before you take the elevator up to the 7th floor of The Restoration, be sure to check out the Port Mercantile, the precious gift shop that sells everything from beer to beard grooming products. At The Watch, you'll want to take a window seat for a stunning view of the Ravenel Bridge. The “Old Exchange,” their take on an Old Fashioned, makes a tasty nightcap. Plus, I just love a rooftop view to end an evening. If you can’t make it to Charleston to enjoy this progressive dinner, plan your own at home! Have fun! *Be sure to stop by The Port Mercantile (pictured above) on your way up to The Watch. Weekend Shopping: Life Changing Magic! If you have talked with me for more than 5 minutes lately, you have probably heard me plug my new favorite guide, The Life Changing Magic of Tidying Up. It is indeed life changing, and teaches you how to only surround your home with things that spark joy. When recently helping a client with professional organization in her fabulously renovated closet, we touched on some dos and don'ts that she can think about to help her discard clothes and other items that aren't serving her. It's helpful to use the same principles not only when deciding what to get rid of, but also to help you be more thoughtful about what to purchase. Here are some of my tips for you to take with you when you shop this weekend, inspired by the kon mari method of surrounding yourself only with things you love. 1. BE NAME BRAND BLIND: "But they are MANOLOs." But are they awesome? There are a lot of fabulous brands out there, and if you want to buy some Manolos for me I will pull out my tutu and channel SJP all day long. However, there are plenty of $50 shoes that are way more awesome than $600 ones. Don't get stuck on the label. Ask yourself if you would stop someone on the street to complement them on the item in question, even if you didn't know what the brand was. Would you still love it if it was from an affordable place like Nine West or Banana Republic? You can spend a lot of money on name brand items and still not be excited about your wardrobe. If you do want to treat yourself to a high-end label, opt for something you could wear on a regular basis and something that is a timeless style. 2. WWRW? Pick a style icon that reflects your own style and represents how you would like your wardrobe to look. My fashion idol is the lovely Reese Witherspoon. She usually looks southern, fun, & nautical during the day, but knows how to be lovely & feminine for the evening. She also has a look that fits in with my casual Charleston lifestyle. Even though I love when I see others with awesome high fashion outfits, I have to remember I'll probably be heading downtown to happy hour and not out to 5th Avenue or the latest LA hot spot anytime soon. So when I'm shopping, I just ask myself What Would Reese Wear? If she would likely pass it up, I probably don't need it! 3. ONLY BUY IT IF YOU WOULD STILL WANT IT AT FULL PRICE. I love a good bargain, but you really do need quality over quantity. The more you fill your closet with great deals that you only sort-of love, the more your other great stuff gets hidden away! Skipping those just because shopping trips and shopping with an intention (I need a dress for this wedding), will help you waste less money on sale items that you bought just to have something new. Then you'll have more to spend on items you really love. A dress you'll wear over and over is worth 2 in the back of the closet (did you catch that "bird in the hand" reference?)! 4. NEW ISN'T ALWAYS BETTER! Instead of attempting to get a new outfit for each new weekend or event, shopping for accessories for something you already have will help you re-love and re-wear your clothes. You can feel just as fabulous in an old outfit, especially if you can find a new way to wear it. Think about having more layers or adding pops of color. Pair a great belt or tights with a dress you usually wear solo, a scarf to a solid top, or a fun pair of animal print shoes to your favorite solid ensemble. 5. FILL UP YOUR EMOTIONAL CUP, NOT YOUR SHOPPING CART. For those of us who love shopping, it can be a rush and a mindless stress reliever. As I've been trying to grow my business, I've needed to be extra thoughtful about spending and saving. Treating yourself is awesome, but sometimes shifting your focus to others is even better. Replacing shopping trips with spending quality time with loved ones or volunteering will make you feel just as good, and that's a fact Jack!